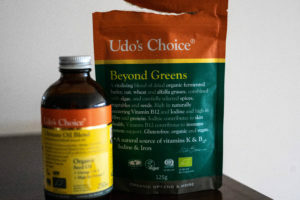 As you may have seen on my social channels, a few weeks ago I took part in the UDO’s Fierce Vegan Challenge – I basically tried and tested a fully vegan diet for x2 weeks, using Allplants meals as my evening meal, and supplementing with Udo’s Choice Ultimate Oil and Beyond Greens powder. I actually really enjoy eating plant based meals, though I have to admit there were 3 things that I was worried about going without: whey protein, eggs and halloumi. Most mornings, I like to have a big thick whey protein shake (with lots of fruit, vegetables, nuts and seeds etc. 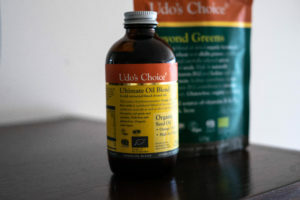 ), for this challenge, I mostly opted for vegan protein overnight oats, with a spoonful of the Udo’s Ultimate Oil. The oil is basically an unrefined and sustainable blend of healthy oils designed to supply the ideal essential fatty acid ratio of 2:! Omega 3 to Omega 6. This is obviously a great alternative to fish oils for vegans. My lunches were generally soups with lentils for added protein, or vegetables and rice with some marinated tofu, or avocado and beans on toast – though some people thought this was a weird mix, I thought it was a good combo! I added the Beyond Greens powder to my soups as it was a really easy way to cram an extra load of goodness in, without even tasting it. The powder is a blend of organic greens which includes fermented grasses, green vegetables and the ‘superfood’ spirulina. It also includes a variety of digestive herbs such as alfalfa herb, ginger root, cinnamon bark and liquorice root, as well as fibre from flax, sunflower and sesame seeds. Each 8g scoop of the greens provides 3g of fibre, 3.4mg of iron, 48mg of calcium, 2g of protein and is considered two servings of vegetables – basically, a good way to make sure I wasn’t lacking in much from a vegan diet! Snacking I found a little challenging at first – though now I am glad for it as it showed me that I regularly grab snacks that aren’t exactly the most nutritional or filling. 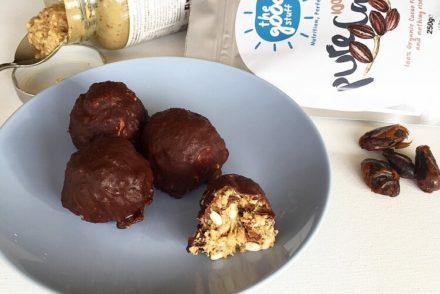 Where I would once grab an over-priced protein bar on the regular, I have switched to things like hummus (Made using the oil blend) and carrots, more fruit and smoothies (using the Beyond Greens) or baked and crunchy spicy chickpeas! 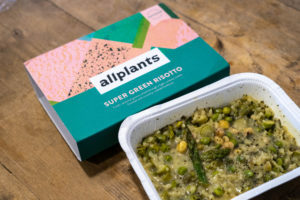 Dinner was kindly provided by Allplants – a convenience meal prep company who supply all vegan meals that sit in your freezer, and take minutes to warm-up! I enjoyed things like vegan mac and cheese, lasagne, super green risottos… all delicious! I genuinely didn’t miss any meat during my dinners. I have to admit, I felt fuller for longer and more satisfied on the vegan diet, plus I felt like I had so much energy. The biggest struggle (apart from missing halloumi) was eating out. Unfortunately, I live in Yorkshire. Not many restaurants cater to vegans, making it hard to be sociable, plus the difficulty when having dinner at friends/families’ homes, it feels difficult asking them to go out of their way to suit your diet preferences. I’m a week post the challenge and I have definitely switched to eating far more plant-based meals and become a lot more experimental in the kitchen, making sure to maintain a high plant intake, plus continued with the Udo’s supplements within my diet! I would love to hear your thoughts/own experiences with trying a vegan diet? *This challenge was kindly gifted to me from Udos Choice. 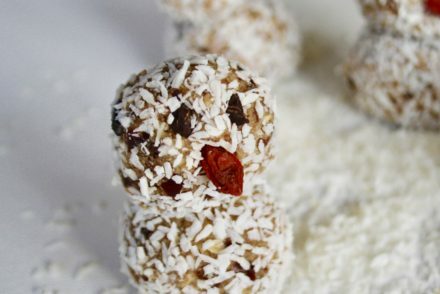 Coconut & hazelnut Christmas snowmen!